The Kettler Axos 3 outdoor table tennis table has a weatherproof top that makes it great for outdoor play. The top is made from high-quality aluminium composite and is 22mm (0.87”) thick which means ball rebound and playability are great. The fitted net has a clamping device for faster and simpler mounting and detaching, and you can fold one side of the table to practise using the playback function. The ping pong table, manufactured in Germany, is easier to transport thanks to the 4 guided wheels, two of which have safety brakes. There is a holder to store 2 bats and 6 balls, and the table is supplied with a conveniently detachable net. 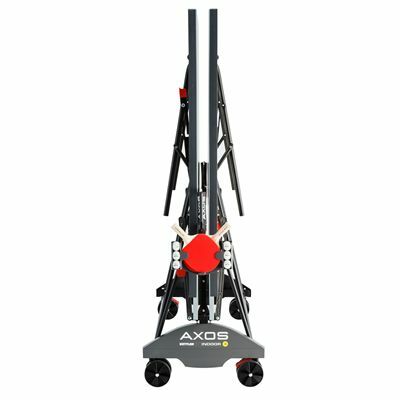 for submitting product information about Kettler Axos 3 Outdoor Table Tennis Table We aim to answer all questions within 2-3 days. 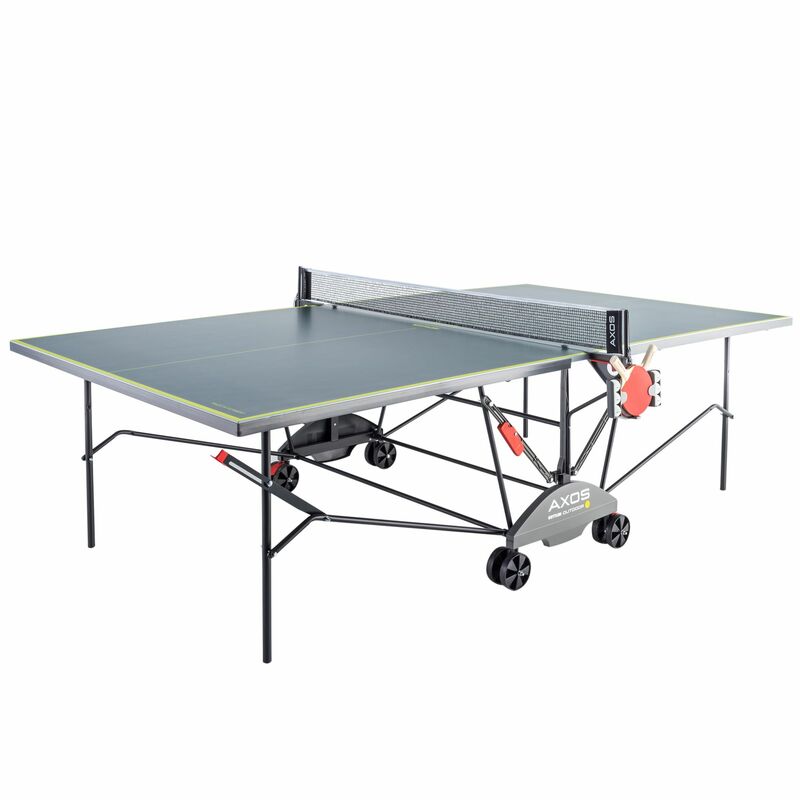 for submitting product information about Kettler Axos 3 Outdoor Table Tennis Table. We aim to answer all questions within 2-3 days. If you provided your name and email address, we will email you as soon as the answer is published. What is the difference between Axos 3 and Classic Outdoor 4? The Kettler Classic Outdoor 4 Table Tennis Table has 4 double off-road wheels. It is fitted with the elastic-band holder on each side so you can store bats and towels there. In addition to this, it has 2 ball boxes that store and dispense balls. It is also equipped with the removable soft-touch edge protectors to shield the table during transportation. Outdoor 4 has also 4 adjustable legs, a feature that allows to regulate the height of the table depending on the players' needs. The box dimensions are - Length 165cm, width 140cm, height 10cm. 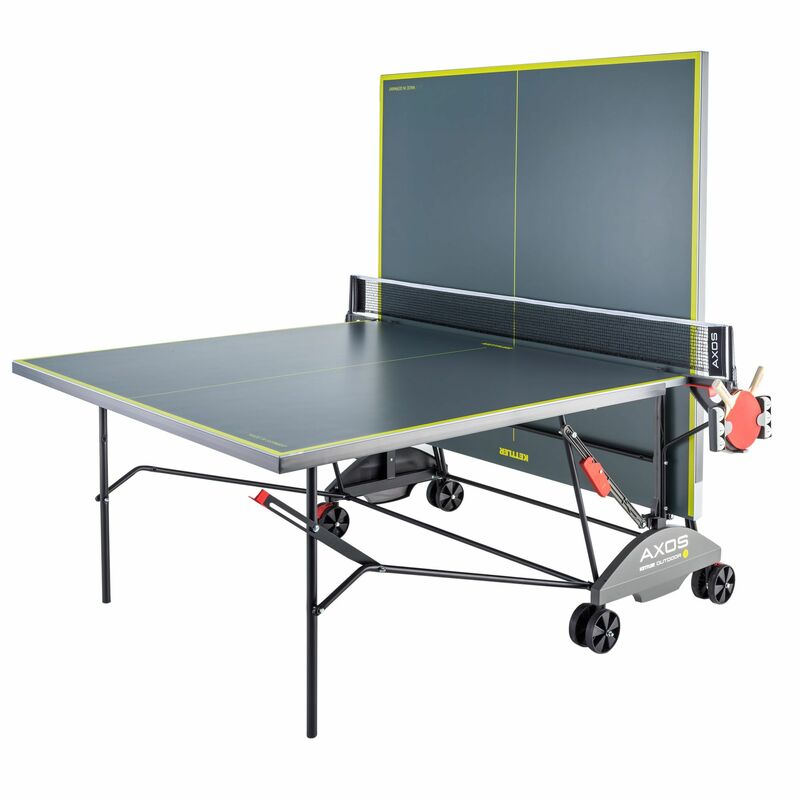 What is the warranty for this Kettler Axos 3 outdoor table tennis table? The table comes with a 10 year table top and 3 year undercarriage Warranty. Great service & speedy delivery from Sweatband team. After our research this table is perfect for our amateur teens needs. Setup was a bit tricky needed 2 ppl and about 3 hours, but, very well built, sturdy & works smoothly. Bonus that 4 wheels are movable and only 1 person needed to open/close. Great buy. The table was bought as a Christmas present. In retrospect it was not a good idea to wait until Christmas Eve day to put it together. It was extremely difficult to construct, the booklet had some ambiguous diagrams and some instructions were missing i.e. how to put the table on the frame. One bolt sheared, a frame pole was damaged and a pin to attach one of the brakes missing. Once completed the table seems sturdy, but it is not the German engineering that I expected. 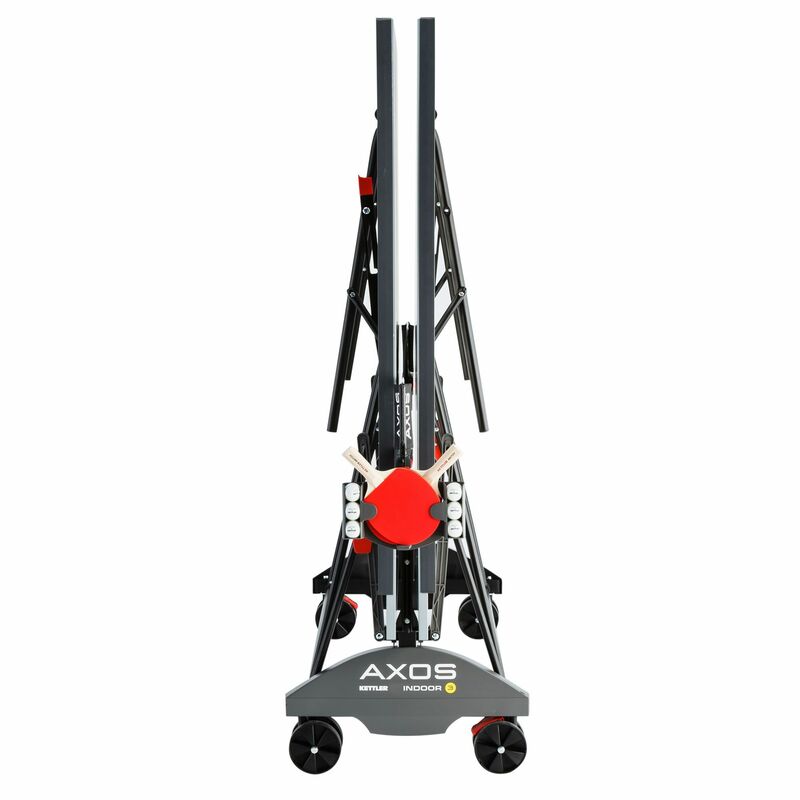 for submitting product review about Kettler Axos 3 Outdoor Table Tennis Table.